A guide to cybernetics and bionics in the world of Rifts. The ultimate reference for cyborgs, bionics, and cybernetics. 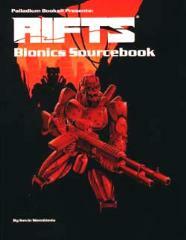 Scores and scores of different types of cybernetic implants, bionic augmentation, weapons, sensors, optics, and gizmos. Expanded information on the Cyborg O.C.C. New City Rat O.C.C.s and insight to the 'Burbs. New Cyber-Snatcher villain, completely statted out. A ton of cybernetics and bionics all collected into one reference book. Optional tables, rules clarifications, cyborg index and ideas. New bionics and cybernetics. Rifts, endless possibilities limited only by one's imagination!